Last summer, I quit the best-paying job I’ve ever had. I’d been working in an office on a 9–5 schedule for nearly three years, and I was run ragged and unhappy. Fluorescent lights were beginning to feel like a personal attack. I quit then lived for three months off precious savings, trying to uncoil from the effect of sitting in front of a computer and on the phone for eight hours, in endless days, for three years. Friends and family would ask why I needed so much time—why couldn’t I bounce back after a week or two of vacation? I could never answer. Instead, every morning, I would sit on my porch and stare at my landlord’s garden. As she shows me various pieces she’s working on for her upcoming show, she muses on how gardens have often been a privilege. Elaine will be the first to tell you that gardens have been a longstanding part of human culture, a space used for good and bad. But as an artist, Elaine’s expression of gardens reflects her own experience working with them, going back to her childhood—her roots. “My dad was a gardener. He owned a greenhouse,” she says. “I spent my childhood working at our family nursery.” She pauses briefly. “Even though it was some of the best times of my life, it was also some of the worst,” she says. “My dad was a complicated man. He taught me things, but he was also fucked-up.” When Elaine shows me her collages, I’m immediately drawn in. Her work is meticulous and calming. 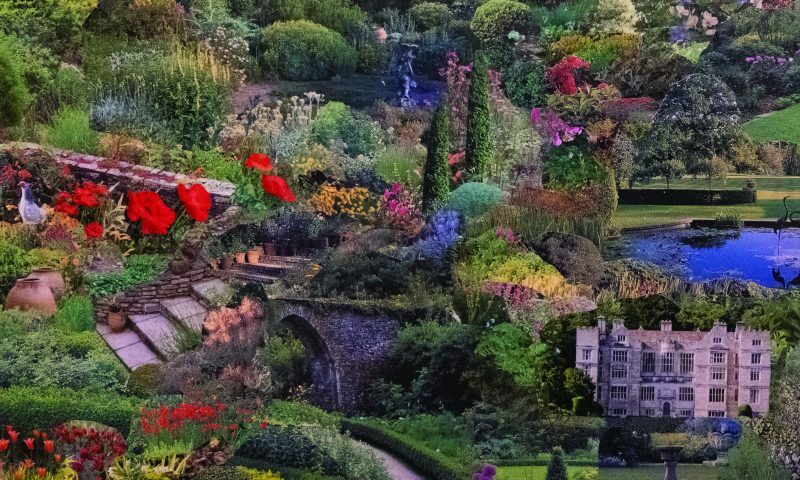 She has created surreal, soothing landscapes that tease out the reality that many gardens evoke—that of an endlessly pleasant path, a space to consider and meditate without interruption. “When you look at a garden, everything organically happens. Color is naturally placed by nature. I try to emulate that in art. I don’t want something to have a focal point—I want the eye to be drawn around.” It’s noticeable. Despite all the disproportion, there is no sense of disarray. 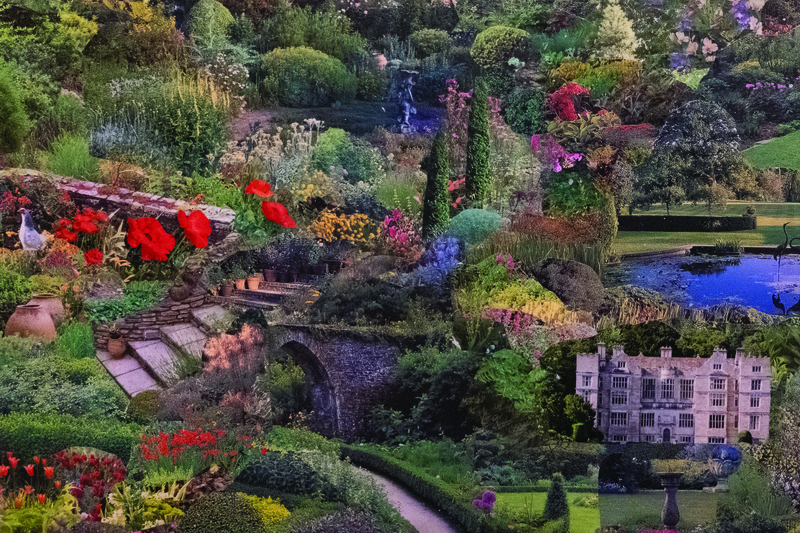 Bushes, mansions and flowers all melt into each other. Elaine offers the audience the healing space she herself has found in both her work and gardening itself. Her last show in 2017, titled Synesthesia, was born from a painful experience and traded in on that pain. “This time around, I feel more grounded. It’s called Rooted because I’m feeling more connected to myself in a stable way. Every day feels calmer.” It makes sense that Rooted offers a kind warmth and immersive healing, focusing on what has allowed Elaine to bloom and inviting the viewer into that space, both figuratively and physically. I am still finding words for why I need the healing that I do, but Rooted is an opportunity to celebrate the fact that we can heal with the kind of experience that a garden can foster—despite not always knowing exactly how we’re doing it. Rooted will open April 20 to the public from 8–11 p.m. and is hosted by Commonwealth Studios. Attendees are encouraged to wear green or floral prints, and Crybaby Bitters will be offering several themed cocktails as well.